If the Oscars turn out to be "so white" again next year, it will not be for a lack of candidates. The 2016 Oscars were mired in controversy when not a single person of color was nominated in the acting categories for a second straight year, and all eight best-picture nominees reflected white, mostly male culture. "2017 could be historic because theoretically we could see all four acting Oscars go to someone of color. It's possible," said Tom O'Neil, editor of awards prediction website Goldderby.com. FILE - Octavia Spencer, from left, Janelle Monae and Taraji P. Henson of the film “Hidden Figures,” present an award at the American Music Awards in Los Angeles, Nov. 20, 2016. "The criticism of Hollywood has been in the past that if you are making a black film, it's either going to be about slavery or civil rights," Hunt said. That is hardly the case for Moonlight, a heart-wrenching, contemporary tale of a black boy growing up in Miami struggling with bullying, his sexual identity and the scourge of drugs. Made with little-known actors, it has gotten some of the best reviews of the year and has been nominated for six Independent Spirit Awards. Hidden Figures, opening on Christmas Day, is the true story of three unsung African-American women mathematicians (played by Octavia Spencer, Janelle Monae and Taraji P. Henson) who worked on NASA's early space missions, while Lion, starring Dev Patel, is the real-life tale of an Indian child who gets lost in Calcutta and is adopted by a white couple in Australia. Loving focuses on an unassuming blue-collar white man and black woman in Virginia who were sentenced to prison in 1958 for getting married. Fences, the movie version of the Pulitzer-winning stage play by August Wilson, is expected to bring Oscar nominations for stars Denzel Washington and Viola Davis. Nominations for Golden Globes and Screen Actors Guild awards are announced next week, while Oscar nominees are unveiled Jan. 24. Most of this year's contenders were in production before the Hollywood soul-searching prompted by #OscarsSoWhite. But unlike some previous years, movie studios are throwing money behind promoting them. "If you have a film that is diverse in terms of the cast and tells nontraditional stories, you're definitely going to get some mileage out of that and promote it. And the media are going to highlight it in ways that maybe they didn't four or five years ago," Hunt said. Ironically, The Birth of a Nation, the slave rebellion drama that looked like an Oscar front-runner earlier this year, now appears to be out of awards contention. 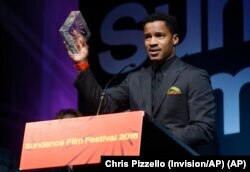 FILE - Nate Parker, the director, star and producer of "The Birth of a Nation," accepts the U.S. Dramatic Audience Award for the film during the 2016 Sundance Film Festival Awards Ceremony in Park City, Utah, Jan. 30, 2016. "The controversy really tripped up the film. It made it uncool to see the film even though it had done very well at early festivals and with film critics," said Goldderby.com's O'Neil. Fortunately for an awards season looking to redeem itself on the diversity front, "there are other alternatives to fall back on," O'Neil said.